A fiesta of prominent compass direction: Sørkapp – the southernmost Tipp of Spitsbergen, the island on the northern edge of the Barents Sea. The sun is shining from due north: midnight sun just under 77 degrees north, not long before the summer solstice. An immaculately beautiful evening with flatcalm sea. Otherwise the short reconnoisance landing on Spitsbergen’s southernmost coast would not have been possible: the waters are so shallow that no ship will be able to anchor really close to the shore. Shortly before we went there, a polar bear was walking near the beach, but it was amazing how far it was away when we finally went. The south cape area is the first part of Spitsbergen that ships pass when coming up from Norway. 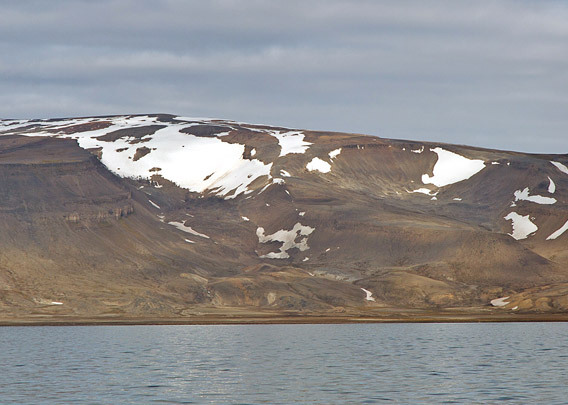 Nevertheless, it has a reputation for being a rather inaccessible area: the shallow waters keep ships away, and it used to be in dense ice well into the summer in historical times. 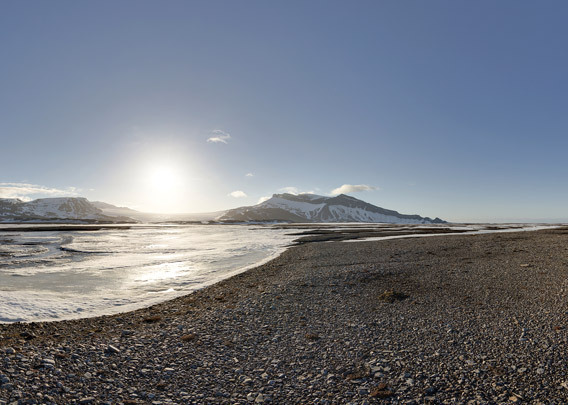 The coastal landscape around Spitsbergen’s south cape is a wide-stretching, very flat country. Because of the cold current washing around the coast, it is more barren and less densily vegetated than other areas further north on the west coast. 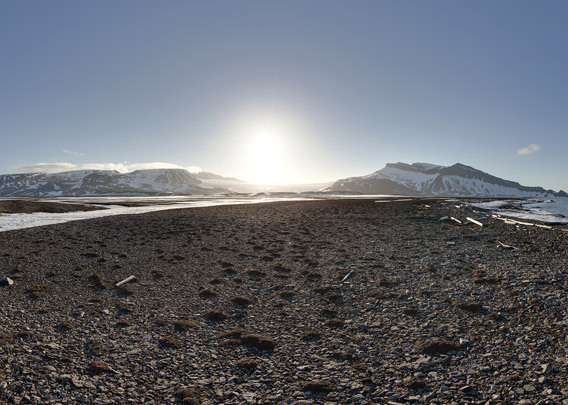 The exact position of the panorama is the little peninsula Moloen (“The mole“), a few kilometers northeast of the southernmost point of the main island Spitsbergen.